We inevitably held Christmas events during December. The first of these was the Village Hall Quiz Night. Decorations left over from Peter and Becky’s wedding were augmented by more lights, a tree and some pretty stars covering the stage curtains. The Committee, guided by Beryl provided food, the bar was open and quiz-masters Carolyn and John Wilde presided. The following night, we held the Christmas Party. This time, Christine and Di organised the delicious cold buffet and with the Hall looking very pretty with tea lights and the new red checked table cloths on all the tables, we had a friendly and enjoyable evening. Paddy Claus turned up again (he came two years ago) having trouble with both his glasses and his ‘wind’! We had a surprise raffle, a round up of the farming year’s events from Bob and ‘How arguments with my wife start’ from James. The evening continued with drinking and dancing. Then, during the next week, ODAS held it’s Christmas Dinner, which was a great success. The next weekend, the Church held it’s annual Carol Concert; with the vicar absent, Di and Pat introduced the carols, singers and readers and read a couple of poems. Many of the readings were done by our local youngsters who made a very good job of it and Barry’s Restoration Singers and The Mudlarks both performed. The church was almost full so thank you everyone who came. This month’s Flicks, Le Weekend was well received with an audience of 20. Does the film decide how many people come or is it the timing? Do Chapel Lawn residents want to see films in their Village Hall? Twelve Years a Slave was November’s Flicks in the Sticks, with a slightly better attendance of 12. At the End of October, the village hall hosted an Arts Alive funded, Two Gentlemen’s production of Shakespeare’s ‘Taming of the Shrew’. Two actors, Dilek and Isaac between them played all the different characters in this classic play, using members of the audience to represent non-speaking parts. It took a lot of brain power to keep up with who was who, but it was also very funny, beautifully acted and great fun to be part of. The film, The Grand Budapest Hotel, though voted to be seen by the most people, was only seen on this occasion by five of us! Oh well, it was a lovely film and is available to borrow from Peter 01547 530530 e-mail Peter Sherman. October 11th. The reception was held in the Village Hall after the service and there was a party in the evening. The service was very musical with the Cezanne Trio playing before the bride and bridegroom arrived and forty members of the Llanfair Singers sang several choral pieces during the service including an anthem composed by Richard Lewis especially for the occasion. Becky rode to and from the church on her 30 year old horse, Indy; however Peter had to walk owing to his horse being too excited to keep all four feet on the ground. The sun came out during the service and shone for the rest of the day. 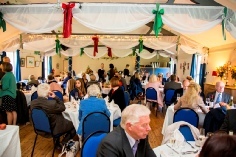 The reception for 60 people was held in the Village Hall. In the evening a party was held for more local friends. 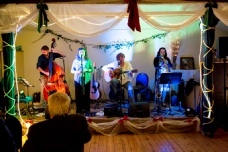 A group of musicians called Kinsley Appleby were playing music for most of the evening, only stopping when they ran out of repertoire (and probably not even then) They played and sang tirelessly and many of the guests danced tirelessly!! Mr and Mrs Sherman would like to extend their heartfelt thanks to everyone who helped make it such a very special occasion. Peter Sherman was elected representative for Chapel lawn on Clun Town Council on 3rd Oct 14. Chapel Lawn and it’s surroundings are coming to life again along with the rest of the countryside! The jubilee tree at the east end of the village has survived it’s first winter and is coming into leaf; Brineddin Wood is slowly greening up too. We have had mixed response to the films shown for Flicks in the Sticks, with some good attendance since Christmas. Please, please, please let us know what you would like to see next season - it is only by letting us know that we will be able to show them! Coming up is the Village Hall AGM. This is your chance to have your say in the way things are run - as above - it is only by getting involved that you will be able to make a difference. We, as trustees are here to help things run as smoothly as possible; we need more involvement from more people, either as trustees or simply advisers, critics, helpers or hinderers! Events don’t happen on their own and the hall is available free to anyone from the Chapel Lawn area to organise an event for the village be it workshop, social gathering or money raising. The only news so far as I know is that it is very, very wet!